Unfortunately, I'm not one of those people who takes much interest in crime reporting, so for me the volume did not hold undue interest. It covers ten notorious diverse cases (from murder to gender discrimination), but most of them are decades old, or even from over a century ago. A volume of more modern cases, say from the last dozen years, would have made for a more interesting and powerful read to me (...the Amanda Knox murder and Bernie Madoff swindle cases are among the more recent ones addressed in the volume). My own interests run more toward current events than history, and so the reaching back in time wasn't particularly effective, but other readers may find these historical accounts more keenly interesting. Each chapter focuses on a different kind of mathematical error (rather than the same sort of probability error occurring over and over) which is probably one reason for the somewhat odd selection of cases employed here. At times the focus on math seems to oversimplify the multitude of legal issues and details involved in a given case, while at other times the mathematical material seems a bit buried under the legalities and details of a case. Still, the basic underlying point that math is often misused/misinterpreted in the courtroom can't be denied, and certainly anyone who doesn't already know that should read a book like this, because it is clearly a message worth spreading. 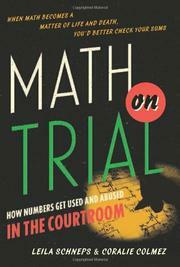 The book ends on the question of whether mathematical evidence should even be allowed in the courtroom, given how easily it is manipulated before a naive jury or judge. The final "Conclusion" chapter discusses Laurence Tribe's 40-year-old "beautifully argued, passionate" article on the subject, before noting that a lot has changed in the four decades hence, especially with the routine use of DNA forensics. Of course DNA evidence can bear problems as well, if not carefully administered, but is also a boon to those falsely-accused who may be exonerated through its use. Lastly, the authors acknowledge the more recent emphasis on Bayesian analysis and the attempt to set standards for its inclusion in the courtroom as well. This volume didn't happen to grab me, but those of you more enamored of true-crime fare, may find it an interesting and worthwhile read, and its ultimate message that the public needs to be better educated as to the uses and abuses of statistics in legal matters is an important one. 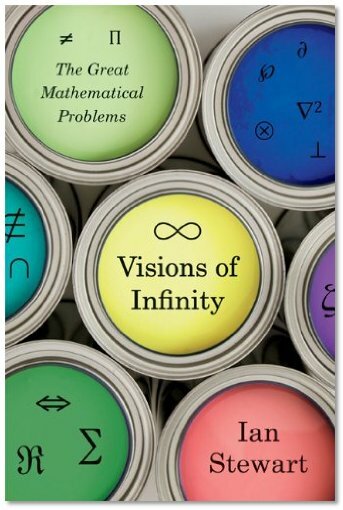 Overview of Ian Stewart's "Visions of Infinity"
"When we think of mathematics, what springs to mind is endless pages of dense symbols and formulas. However, those two million pages generally contain more words than symbols... As the great Carl Friedrich Gauss remarked around 1800, the essence of mathematics is 'notions, not notations'. Ideas, not symbols." Ian Stewart (or one of his clones… because I refuse to be duped into believing that one person can write all these books!) has a new volume out, "Visions of Infinity." There are several popular math books available that review a variety of the most famous, intriguing often-unsolved problems in mathematics (the exact selection can vary slightly from volume to volume, though certain standards almost always show up). Anyway, this is Stewart's contribution to the genre… and… as one might expect, it is excellent. If only it had been written first, some of the other attempts might even have been unnecessary. To be clear though, while this volume covers some of the most interesting problems in all of mathematics it is NOT a book to draw your non-mathematical friends into the math arena. Even the non-math person who wishes they could like math, and who may have enjoyed Steven Strogatz's "Joy of X," I think will find this particular book too heavy-going. But for the individual already enamored of the subject, and having some familiarity with math's deepest problems, this is a fantastic read. In fact, it's probably my favorite Stewart volume of all the ones I've read. Stewart gives enough background and depth to each discussion to hold the attention, and exercise the brain, of most math buffs, without getting so technical as to lose them in the dust (though parts, toward the end especially, are definitely tough-going). I have no idea if he was able to produce this work largely based on his past writing and knowledge, or whether it required lots of research on his part to fill in all the detail, history, and richness that are on display here... either way the book is a great accomplishment. Fermat's Last Theorem, the Riemann Hypothesis, the four-color theorem, the Goldbach conjecture, the Poincare' conjecture, and P vs. NP, are among the classics Stewart rolls out for scrutiny (the title may be a bit misleading in so much as "infinity" is not really the central topic). He does a great job of not only explaining these mathematical conundrums in an accessible way, but also of detailing their histories, context, and relevance (when it exists) to other matters. The first few chapters tend to warm the reader up. From there the book moves on to more complex and difficult problems as it goes along. The last couple of conjectures dealt with, the Birch--Swinnerton-Dyer conjecture and the Hodge conjecture, are the densest to follow (...but Stewart notes of the Hodge conjecture that it "is arguably more representative of real mathematics, as done by mathematicians of the twentieth and twenty-first centuries, than any other topic in this book"). Soon after those chapters Stewart follows up with a lighter chapter titled "Twelve For the Future," briefly outlining 12 more unsolved problems, some fairly well-known. This section ends with the ABC conjecture, and was apparently written before last year's announcement from Shinichi Mochizuki that he had proven the conjecture, as there is no mention of the claimed proof (which has yet to be confirmed, and indeed some say may not be comprehensible to anyone except Mochizuki!). I suppose my favorite chapter (pardon the bias) is on the Riemann Hypothesis, where Stewart seems to capture in a chapter what others have written whole books about. Another chapter that I found especially good was on the Mass Gap Hypothesis, and more generally on particle physics, but your own interests will determine which chapters you most enjoy. They are all good. This will likely be the initial 'go-to' volume on my shelf whenever I wish to check on something regarding one of these classic problems. The book ends with a handy 11-page glossary, an interesting set of succinct "notes," and a brief bibliography for "further reading" -- on a side note, I was pleased to see that the brief bibliography cites Matthew Watkins' "The Mystery of the Prime Numbers," a book I've been touting for quite awhile, but which I'd not yet seen referenced by any prominent author (Watkins gets a very brief mention in the body of the book as well). This is simply a fabulous book for most mathematics enthusiasts... no matter which clone of Stewart's wrote it! "If you already love math, welcome. If you were traumatized by a math class years ago, welcome. If your relationship with math is complicated, welcome. I hope there will be something here for everyone." -- Evelyn Lamb, from her first blog post for "Roots of Unity"
Evelyn Lamb is a mathematics writer and post-doc who was a relatively recent addition to the stable of bloggers at Scientific American. Her blog "Roots of Unity" is fittingly subheaded, "Mathematics: learning it, doing it, celebrating it" and her SA profile is here. 1) You mention in your blog bio that you didn't really get interested in math until your junior year of college… that is so contrary to what I usually hear from mathematicians (who often grow up with an unusual and inherent interest in math and numbers from early on). Can you describe a little further what that was like coming to math relatively late in your academic life (did it feel odd? 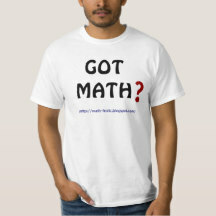 did other math majors look a bit askance at you? was it a smooth or difficult transition?…)? In general, I grew up thinking of math as just formulas: you look at a problem, there's one way to do it, you do it, and then you get the one and only answer. I was good at this, but it didn't excite me. I went to the Texas Academy of Math and Science for my last two years of high school. That is a program at the University of North Texas where high school students who are good at math and science take UNT classes during their last two years of high school. There, I went through the calculus sequence to multivariable calculus, so when I got to college, it made sense to me to work on a minor in math because I had so many math credits already going in. My junior year, I took a class that really changed the way I looked at math. Coming to math so late in the game has been a challenge, and I still sometimes feel "behind." I was one of the top math students at my university, but at the time their math program was not what it is now. My first semester of grad school, I got a big dose of reality when I saw how difficult the qualifying exams were and how much better prepared everyone else seemed to be. My grad program was very small, and faculty and other grad students were very supportive of me. I felt out of my league a lot of the time, but it was internal. No one there tried to push me out or make me feel like I didn't belong. 2) You also mention that an "inquiry-based learning" class is what really turned you on to the beauty/creativity of math. Again, can you say a little more about what were some of the problems/examples that most moved you? The class, basically "intro to proofs," was taught using the Moore method, or inquiry-based learning, meaning that our professor prepared sheets of definitions, examples, and theorems for us to work on outside of class. During class periods, students would present material for the whole class, and those who weren't presenting would ask questions or point out errors in the proofs. The professor worked very hard to make it a "safe space" for people so they wouldn't feel bad about being wrong. We pointed out errors in each other's work, but it was always done in a constructive, kind manner. That class, more than anything else, showed me that math is a creative discipline. The second concept was proving that the rationals are countable and the real numbers aren't. I had worked for about a week on a proof that the irrationals were of a different cardinality than the rationals—my intuition said that n^2 just had to be fundamentally "bigger" than n, and there was some kind of "limit" argument that the irrationals had to be more numerous than the rationals because of this. Obviously, my proofs were not correct, and when another student presented a (basically) correct proof, I was very resistant to it. It took a while for me to learn to accept it, but that process of wrestling with the idea for so long was formative for me as a mathematician. I'm not saying that inquiry-based learning is necessarily the best way to teach all topics, or the best way to teach all students, but I can say that there is a 99% chance I would not be in math today if I hadn't taken that inquiry-based learning class. 3) How did the idea for your blog, "Roots of Unity," for Scientific American come about? I had a fellowship at Scientific American during the summer of 2012, which is how I started writing about math and science. Through that, I met Bora Zivkovic, the blogs editor for Scientific American. Both he and my immediate supervisor Robin Lloyd recognize that Scientific American's audience would like to read more math stories, so they were very supportive of my coming on board with my own blog. I'm really grateful to both of them and my other colleagues at Scientific American for encouraging me and helping me find an audience by giving me the Scientific American platform. 4) I would guess that anyone writing ongoing math pieces for Scientific American might feel the long shadow of Martin Gardner over their shoulder… is there some sense of that for you, or are your pieces different enough (and not restricted to recreational math) so that you don't feel that sort of connection? I definitely feel the shadow of Martin Gardner! I do want to entertain people and help them engage with math, two things that he did very effectively. I do not know very much about recreational math, so I haven't ventured into that world very much yet. And there are already so many places where that is done so well! I will never be Martin Gardner, but I try to see myself as an entertainer at least as much as an educator. For the most part, I want my pieces to make people happy. If they learn something as well, that's a nice bonus. Sometimes I write about things that aren't happy, but I prefer the happy stuff. 5) What are your favorite aspects of mathematics to study or read about? 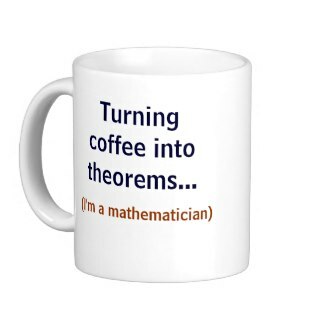 And what is your math post-doc work related to? My field of study is hyperbolic geometry and Teichmüller theory, which is the study of spaces of hyperbolic surfaces. I use analytic techniques to attack geometric problems. I am a very visual person, and I love the visual aspect of hyperbolic geometry. I love reading (or looking at) books of mathematical art, particularly when it has to do with hyperbolic geometry. I have recently gotten more interested in math history, which I am actually woefully ignorant of. In my work for Scientific American, I have come across some biographies of famous mathematicians and books of ancient Chinese math, for example, that fascinate me. I do love to read popular books about math, in part as professional "research": how do more experienced math writers approach the subject, and what are their personal styles? I am still working on finding my voice and tone, so hearing the masters do it is very useful to me. 6) Who are some of your favorite mathematicians (living or deceased) to read? I've also read two popular math books in the past few months that I really enjoyed: "Measurement" by Paul Lockhart and "The Joy of X" by Steven Strogatz. They are very different from each other, but both are worth a read. I read Measurement twice because I wrote two different book reviews of it, several months apart, and the second time through, I found it even more delightful. Lockhart reminds me of Thurston in some ways: both talk about math as a human activity in ways that speak to me. One of my uncles gave me Strogatz's book "Sync" back when it was published, and I've tried to keep up with his writing since then. I was very excited that I got to meet him this past summer when I was in Ithaca for my brother's wedding. It turns out he was on my sister-in-law's oral exam committee. She is a grad student in physics at Cornell. -- I thoroughly enjoyed and reviewed the Lockhart and Strogatz volumes as well, and Bill Thurston was certainly one of the most loved and respected members of the math community. 7) In an earlier piece you wrote that working at Scientific American made you feel like "two different people" -- being a reporter of sorts (educating the public) for SA, but also still wanting to be a discoverer, as an academic mathematician… Now that you're a regular blogger for SA I imagine that writing for the public becomes increasingly smooth and enjoyable over time. How strongly do you still feel pulled in two directions, or are they more integrated by now? I very much feel pulled in two or more directions, but that is pretty normal for me. I have always had many divergent (sometimes competing) interests, and I feel like I've spent most of my life fighting to keep as many options open as possible. I am just the kind of person who wants to have lots of different mental stimuli over the course of a day or week. I have the luxury this year of establishing myself as a writer/blogger before starting my postdoc. Once I get there, I will have a whole new challenge of balancing my new professional responsibilities with my desire to write about math for a broad audience, but I know a change of scenery will also give me new inspiration. My writing has given me a lot to think about when it comes to teaching, and I expect and hope that my work on my blog will help me become a more effective teacher. 8) How do you select the topics you post about on your blog? So far this year, I've been to three large conferences, and I've gotten lots of ideas from them. But I don't have one tried and true way of finding stories yet, which means a lot of the time I put into my writing is "invisible" and just consists in figuring out story ideas and rolling them around in my head until they work. I am naturally attracted to stories that involve math and the arts because I find it easier to draw people into those stories and because I love the intersection, so I like to have an excuse to spend a lot of time thinking about them. 9) To round yourself out a bit, when you're not doing mathy things, what are some of your main interests/hobbies/activities? I have way too many hobbies! My mom is a musician, and I have been involved in music since I was a toddler. Currently, I play viola with some amateur chamber music groups and sing shape-note music, a kind of early American folk hymn singing. I also sew, which I actually think of as applied mathematics, and I have been trying to learn to crochet. My husband and I live about a mile from Lake Michigan, and when the weather is nice, we like to walk down to the lake and collect beach glass. We also collect it on trips if we're near a shore. We have a few vases and bowls filled with it, and I've used it for some art projects. We also like riding bikes, doing yoga, and playing ultimate frisbee, although we haven't done a whole lot of that recently. We both do a lot of cooking, and we love traveling. Recently, most of our traveling has been to math conferences and to visit family, but we try to work in some personal vacations as well. 10) Any parting words, not covered above, you'd care to pass along to a math-oriented audience? When you don't know what to do, do something. I think that's important both in mathematics and in life. When I am teaching or tutoring, I find that students get stuck the worst when they are afraid to write anything down before they're absolutely sure they have the right answer. People sometimes think mathematics happens when a smart loner has a sudden bolt of inspiration, but I think much more progress happens when people, often in collaboration, try lots of different approaches to the same problem until something works. At all levels of study, much of mathematics consists of getting used to techniques that you can get an instinctive feel for what technique might work for a new problem. In life, I try to use the same approach. I don't know what I'm doing with my writing exactly, but I'm doing something, and I'm getting a feel for what works and what doesn't, and what kind of math stories people want to read. THANKS so much, Evelyn, for these great responses and best of luck both with the blogging and your academic future. Be sure to check out Evelyn's blog HERE, if you haven't already.